Primarily it is a means of saving a tooth by the removal of the pulp that is found inside every tooth. Pulp is the term for all the tissues inside the canal, i.e. nerves, arteries and veins. After the pulp has been removed the tooth can no longer react to its environment and no longer trouble you. 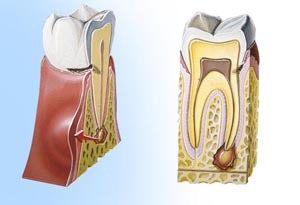 The huge advantage of Root Canal Therapy is that it gives a tooth a second life - an alternative to an extraction. Root Canal Therapy includes the procedure of filling up the now empty canals that remain after removal of the pulp with special sealants and fillers. It is a tricky procedure and sometimes may take numerous appointments to complete. WHY SHOULD A TOOTH NEVER BE REMOVED? The nerve has died (a dead nerve will result in the formation of an abscess if it is not removed.) Any bacteria that accumulate in the close pulp chamber or root system will eventually destroy tissues and lead to the formation of liquid (pus). The pus, together with rising pressure inside this close chamber can lead to intense pain and swelling, that typically represent a tooth abscess. Very often NO PAIN is present during the development of a chronic abscess. Discoloration is likely to occur later, but bleaching and crowning are good options to restore the colour to its original state. In the long run the tooth becomes more susceptible to fracture and it is advisable to strengthen the tooth with some form of restoration, usually a crown. CAN I EXPECT ANY PAIN OR DISCOMFORT AFTERWARDS? Following Root Canal Therapy the tooth sometimes feels traumatized and tender. It can also be painful for a few days. This pain does not originate from inside the tooth, but is itself a response from your body's immune system. Inflammation takes place in the tissue surrounding the root and causes pain. Another factor is that if there was an infection, like an abscess, the tooth is more likely to pain afterwards, because of a stronger reaction from your body's immune system. Your tooth is very weakened, because of the temporary filling. Expect some pain that can last for about 72-hours. It can be controlled with anti-inflammatory medication. Make sure your final filling / crown is not too high in the bite, because this can cause unnecessary discomfort. Contact your dentist to ease the restoration if necessary. Report back to your dentist after 6 months for follow up x-rays to determine if everything is still in order. Sometimes a painless re-infection can occur.